Sasol Performance Chemicals' Inorganics & Catalysts Division is one of the world's leading producers of high-purity and ultra-high-purity synthetic speciality aluminas and related products such as silica-aluminas, hydrotalcites and spinels. Our customers value our aluminas for their particularly high level of chemical purity and high dispersibility as well as the fact that key characteristics including pore volume, particle size and specific surface area can be adapted to their specific requirements. Our portfolio comprises more than 400 customised product specifications. Our products are used in a wide range of applications such as catalyst supports in the automotive industry, in chemicals and refineries, plastic additives and high-performance abrasives. They also play a vital role in the manufacture of synthetic sapphires for the production of LED lights and scratch-resistant glass for watches, checkout scanners and consumer electronics, bio-ceramics as well as special ceramics. The Inorganics & Catalysts Division is also accountable for the marketing and sales of Sasol’s proprietary GTL catalyst. Sasol's Inorganics & Catalysts Division produces high- and ultra-high-purity aluminas primarily through synthetic aluminum alkoxide processing routes. The alumina is produced either as co-product with synthetic linear alcohols (Ziegler method) or directly from aluminum metal (on-purpose route). Several production steps must be completed to produce the different aluina-based products. 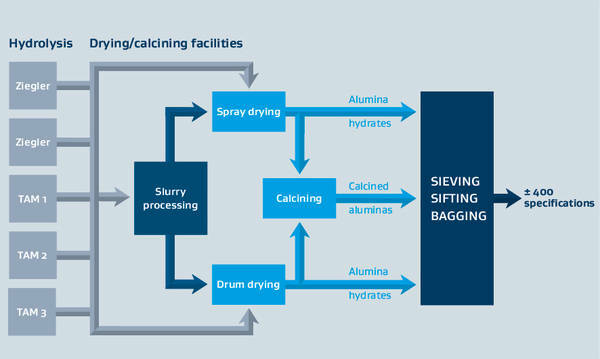 In the first step, an aqueous intermediate (alumina slurry) is produced, which is further tailored in the subsequent processing steps to obtain the various products sold on the market. These can be alumina hydrate, calcined aluminas and doped versions thereof.